The art of Xu Zhen plays provocatively with the notion of collision: from cultural ideologies and global histories to the act of creation and power of commerce. These central tensions relate closely to the climate of the early 2000s -- a time of unparalleled economic development in China and rapid globalisation. This was the era in which Xu Zhen emerged on the contemporary international art scene as China’s representative at the 2001 Venice Biennale at the mere age of twenty-four. In 2009 the artist founded MadeIn, an ‘art creation company’ that knowingly echoes China’s positioning as a global centre for the manufacturing of goods while also exploring the contested terrain between commercial production and artistic authenticity. This work – along with its companion 'Famille-Rose Olive Vase with Bat and Peach Design' -- resembles traditional Chinese porcelain in its materials and surface embellishment but takes on a comical new demeanour with its neck appearing to have bent or wilted. 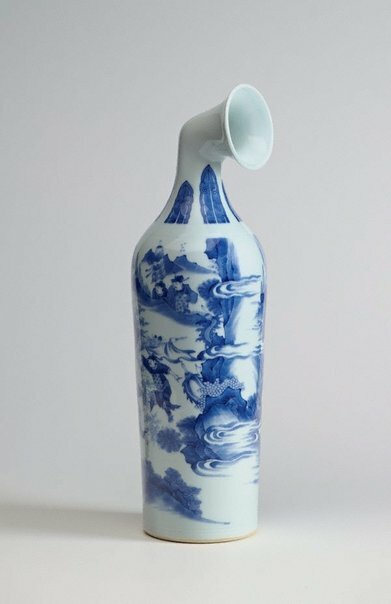 It is through such hybridised forms that Xu Zhen poses questions about his role and value as an artist in contemporary China as compared to the artisans who produced some of the finest ceramics in China’s history. He also considers the way traditions can become mongrelised, lost, reinvented or commodified in our globalised world. Kevin McGarry, Flash Art , 'Company of Man - Xu Zhen/MadeIn Company', pg.80-87, Milan, May 2014-Jun 2014, (colour illus.). Frieze no.163 , London, May 2014, (colour illus. ).